This sterling silver Celtic wedding band features engraved Trinity knots that are enhanced with oxidized accenting. 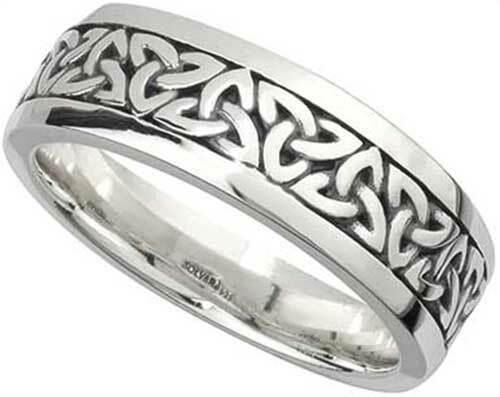 The Celtic wedding ring measures 3/8" wide and it is a suitable size band for a man. 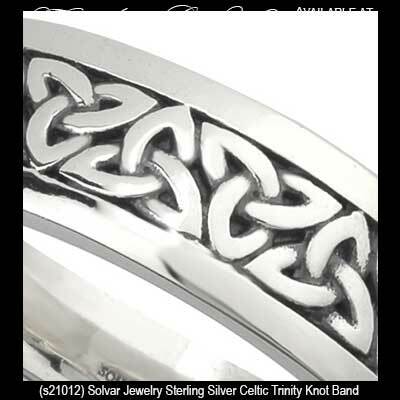 The Trinity wedding band is made by Solvar Jewelry in Dublin, Ireland and it is gift boxed with a Celtic knot history card, complements of The Irish Gift House. Sterling silver Celtic band features the Trinity knot and it is suitable as a women's wedding ring. Celtic wedding band features a sterling silver men's design that is enhanced with gold Trinity knots along with oxidized accenting. Celtic wedding band features a sterling silver women's design that is enhanced with gold Trinity knots along with oxidized accenting.